Comics In 5 Panels: Teen-Hero Month: Batgirl. You know, considering that Batman is suppose to be this big loner, the dark knight who rides alone in his battle against evil, he sure has had a lot of kids hanging around the Bat-Cave through the years. There has been four boys and one girl to be known as Robin, and three young women to carry the tittle as Batgirl. The second Batgirl is possibly the oddest member of the Bat Family. Her name is Cassandra Cain. She’s the daughter of the elite assassin David Cain, who raised her to be a living weapon. Her father never taught her how to talk, and instead had her body trained to read other people. Martial arts became her language, so to say. Once she reached the age of eight, she committed her first murder. Only, she didn't understand what she was about to do. But after the man was dead, and she had his blood on her tiny little hands, she realized that she had done something terrible. Horrified and ashamed, she ran away from her father, and spend the next nine years of her life as a homeless mute, until she met Barbara Gordon, AKA Oracle. 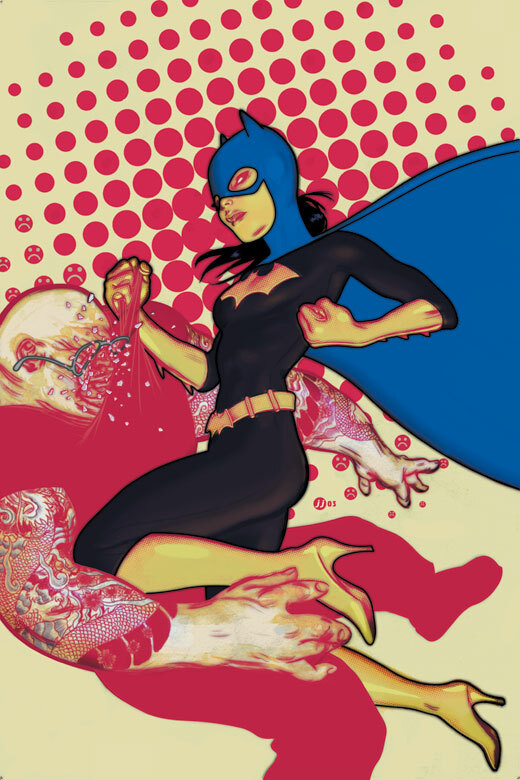 Because of her skills and after playing an important role during the Batman story-line "No Man's Land," she became part of the Batman Family, and was given the identity as Batgirl. There are several reasons to why Cassandra is the weirdest member of the Batman Family. First of all, there is the killing-part. Batman and the others has made an oath to never take a life, but it can sometimes be tempting for them. Heck, Batsy wanted to kill the Joker for YEARS, but never did it because he knew that if he crossed the line ONCE, there was no coming back. But Cassandra HAS killed. She knows exactly how to do it and what it is like. And she never wants to do it again. Another thing is that Cassandra is the most physical one of the Bat-crowd. Sure, all of them fights, but they rely on they heads as much as their fists. I'm not saying that Cassandra is stupid, not at all. But she is not an detective, not a hacker, not a master strategist. She is the ultimate fighter with a style that can not be copied. She knows exactly what kind of moves you are going to make five years before yourself do. She fights, therefor she is. But it's not by choice. She has been isolated from anything not fighting related. She does want to learn how to read and speak and anything else required to move away from being nothing but a living weapon. So there is an innocence to her that is simply to die for. The first 37 issues of the series(written by Kelley Puckett) are the best of the series, and pretty much flawless. Mostly single-issue stories, which is the way I like it. Highly recommended. But for the rest of the series, the quality is quit... swinging. In fact, I didn't like the writing of Dylan Horrocks at all. And for some reason, the series ended at issue 73, which is an odd number. But that might have something to do with the fact that DC for some dumb reason decided to blow Bludhaven up. Almost as soon as she became the city's new hero. So please try and give this series a chance. The sad thing is that Cassandra had a lot of qualities as comic-book character, but she got the short end of the stick compared to the rest of the Bat-Family. Next time, we will take a look at a group of young heroes who you could call the world's most powerful bastards.